St. Martin's Griffin, 9780312607319, 240pp. Had enough of that bridezilla? Feeling alone in a new city? Dealing with the trauma of the worst breakup ever—with someone you never even made out with? We've heard the path to fulfillment has much to do with relationships. But while it's often thought that for young women, it's all about finding the right man, real women beg to differ: It's friendships that are at the heart of happiness. Unfortunately, they're also at the heart of drama, stress, and sometimes not-so-great escapades after that fifth martini. And, technology, from texting to Facebook, has made all friendships more complicated than ever. 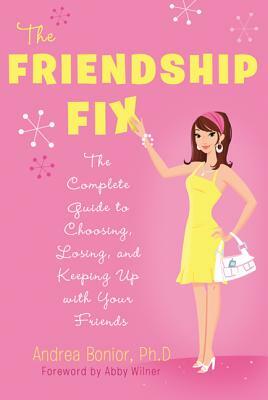 At last comes The Friendship Fix, jam-packed with practical ways to improve your life by improving your circle. From dealing with friends-with-benefits to coworkers from the dark side, from feeling alone to being desperate to defriend a few dozen people, Andrea Bonior, Ph.D. helps you make the most of your friendships, whether they be old, new, online, or in person. Andrea Bonior, Ph.D., is a licensed psychologist and author of the popular weekly mental health column "Baggage Check" in the Washington Post Express. Her expertise has appeared in such places as CNN.com, MSNBC.com, and Good Housekeeping. In addition to maintaining a private psychotherapy practice, Andrea serves on the faculty of Georgetown University. She lives with her family in Maryland.